At a time when Donald Trump is vowing to “make America great again,” Americans think the country already is pretty great – at least when compared with other nations. Our recent report on views of America’s Place in the World found that 72% think the United States is the world’s leading military power, while 54% say it is the top economic power. While the U.S. has long been viewed as the dominant military power, this marks the first time in surveys since 2008 that more than half said the U.S. is the top global economic power. China ranks a distant second in the public’s view – just 34% rate China as the top economic power. A year ago, 46% said the U.S. was the leading economic power, while 36% cited China. But while most Americans see the U.S. as the global economic and military leader, many also said the U.S. is not quite as powerful a player on the world stage as it used to be. In a separate survey, nearly half of Americans (46%) said the U.S. plays a less important and powerful role now than a decade ago, compared with 31% who said its role is still as important and 21% who saw it as having increased in importance. While the share saying the U.S. is less powerful has declined modestly since 2013 (53%), it has more than doubled – from just 20% – since 2004. Moreover, a large majority (61%) said the U.S. is less respected by other countries now than in the past; 14% said the U.S. is more respected, while 22% said it is as respected as in the past. The belief that the U.S. has lost respect globally is not new: In polling since 2004, majorities of the public – ranging from 71% in 2008 to 56% in 2009 and 2012 – have said the U.S. is less respected globally. There is general partisan agreement in views of the world’s leading economic and military powers. But Republicans and Democrats differ sharply over whether the U.S. is now less powerful and important than it was a decade ago. Large majorities of Democrats (73%), Republicans (66%) and independents (76%) say the U.S. is the world’s leading military power. And comparable percentages of Republicans (56%), Democrats (55%) and independents (50%) said the U.S. is the world’s leading economic power. 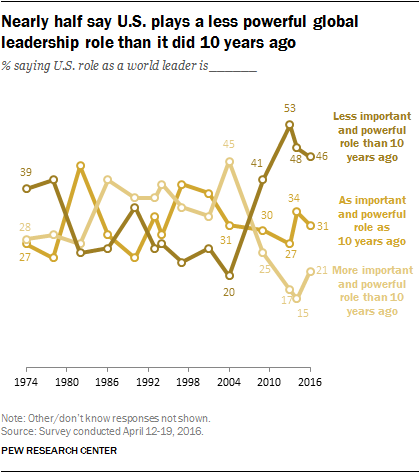 However, as has been the case since Barack Obama became president, a sizable majority of Republicans (currently 67%) said the U.S. has a less important and powerful role as a world leader than it did a decade ago. And while this view is particularly widespread among GOP voters who backed Trump in the primaries (77%), most Republican voters who did not support Trump agreed (66%). Nearly half of independents (48%) and only about a quarter of Democrats (26%) said the U.S. is less powerful and important, and there are no significant differences between Democratic voters who support Hillary Clinton and those who support Bernie Sanders. By contrast, there is greater agreement among Republicans and Democrats that the U.S. is less respected than in the past. 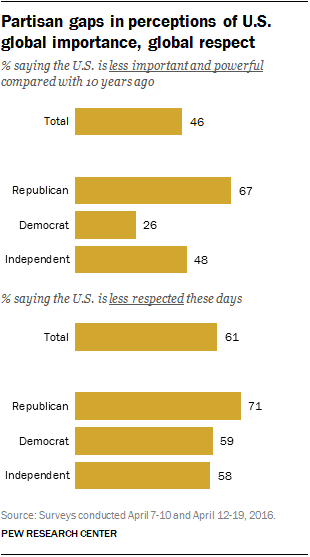 About seven-in-ten Republicans (71%) say the U.S. is less respected by other countries, as do majorities of both Democrats (59%) and independents (58%). In 2008, during the Bush administration, majorities of all partisan groups also said the U.S. was less respected internationally than it had been in the past. At that time, however, a larger share of Democrats (81%) than independents (72%) and Republicans (60%) said this.